And yes, I meant to not finish the chorus of that song. Why is there not an on/off switch for growth?? Seriously. My babies just aren't babies anymore. Again, I say, "Seriously". I just don't have a clue where time has gone. 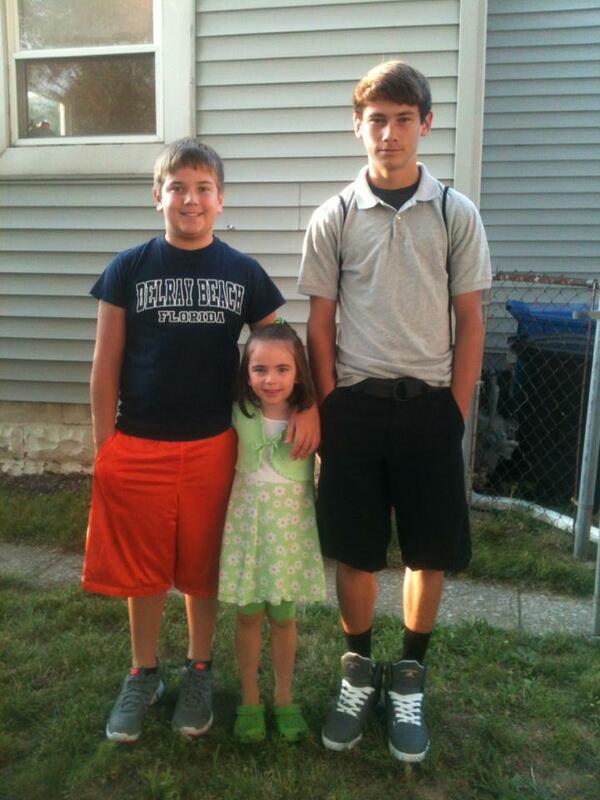 Here at home we now have (from left to right) a 7th grader, a kindergartener, and (gasp) a freshman in high school. Yikes. A Bullet, a Bee, and an Oiler. Double yikes. 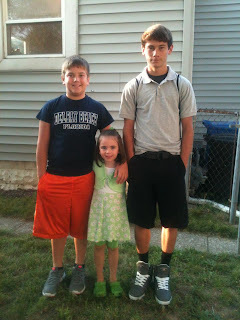 Today was the second day...tears still welled when dropping the youngest off, but they didn't fall this time. And when I say tears, I mean mine, not hers. She went right off and sat down on her line to wait to go into class. She did eventually wave to me and blow me a kiss, but otherwise she was good to go. So...until I get hours at my current job that work with the kids' school (or get a different job that offers the same), I'm left with a lot of free time during the day that I'm just not used to! Yesterday I did some general picking up and cleaned a couple stains off the carpet. Today, I tackled the top of the refrigerator. Better, no? I've got too many spices to fit in the spice shelf of my pantry, so I keep the most used ones in that storage box. 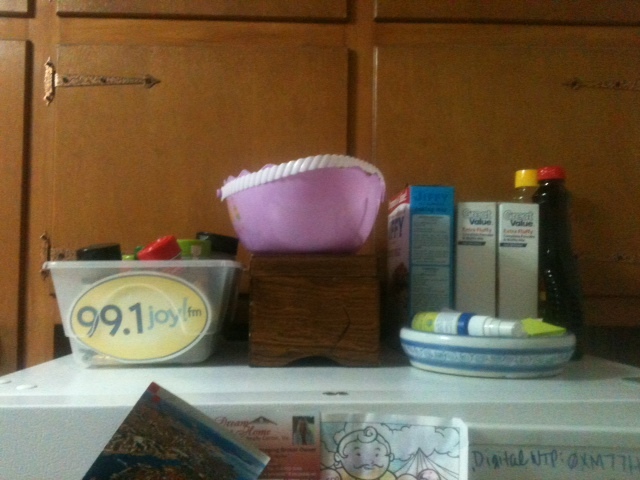 Next is my recipe box. My Opa made it, and my Oma put the picture onto the top (can't see that in the picture, sorry). Clearly, the purple buckety thing atop the recipe box is a candy bucket...we hide treats there out of reach of the youngest treat-snatcher. Next is the pancake mix, along with syrup (again, lack of space for that many boxes/bottles, but we eat a lot of pancakes!). Lastly, the blue and white dish stores dry erase markers for our wipey board we keep on the fridge. So, my lucky friends, I've decided to be completely transparent from here on out. I'm going to try to work one big thing each day (along with the normal cleaning) and I will take before and after pictures to share my progress. I KNOW. Tomorrow I really, *really* want to do the dining room table. You won't believe it. I promise.